A cluster of mealworm beetle eggs laid on the bottom of a plastic dish. There is very little parental care in the mealworm beetle and in most insects. Males only give sperm and a few nutrients to the female. Females put in more care than males, but still not very much. After mating, females must search for good places to lay their eggs, because after laying them, the female abandons them to fend for themselves. For mealworm beetles, this good place is in a pile of wheat bran or flour, which is the food for the young. Mom doesn't help them after they hatch, but at least she makes sure they have enough to eat. A female can lay many eggs in one day, and in her lifetime can lay over 300 eggs! 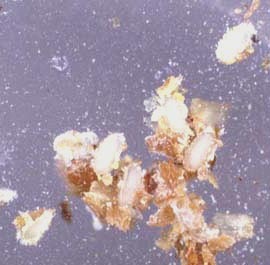 The egg is the first body form in the life cycle of the mealworm beetle. Read more about: How Do Beetles Reproduce?